Original described by A.G. Sharov in 1971, it originally caused a sensation. The body appears to be covered with thick, half centimeter long hair. The wings, and tail were hair free. 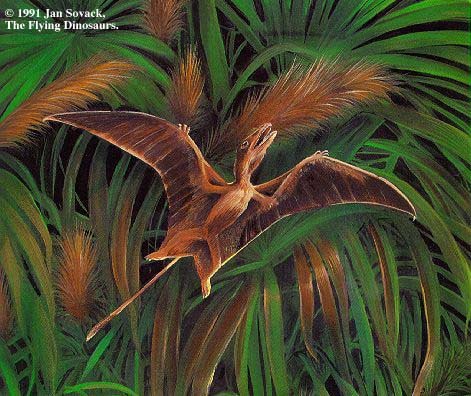 The hair-like covering provided more evidence that Pterosaurs were ectothermic as the hair would have insulated the body and provided a more streamlined profile in flight. The wing membranes are clearly seen to be attached to the legs, and there is a secondary membrane stretched between the legs. The tail is not attached to this secondary membrane and is left unimpeded. Sordes (To hear pronunciation choose: Mac/Win) is a small pterosaur not much larger than a pigeon. Like all Rhamphorhyncoids the jaws contain teeth. In Sordes the teeth are small and delicate suggesting a diet of amphibians.